The Transparent Lilies (1991-2009) composed by Thanos Anestopoulos (vocals / acoustic guitar / harmonica / piano / organ – lyrics), Nikos Bardis (guitar / trumpet / percussions / synthesizers ), Kyriakos Tsoukalas (guitars / keyboards / percussion / tone generator), Pantelis Rodostoglou (electric bass – lyrics), Tasos Mahas (drums / percussion) and Panagiotis Berlis (vocals, keyboards, composition / orchestration, 1995-2000). Formed in 1991. In 1994 was released from Wipe Out records, the single “Melting by my self / Beneath the Volcano“. 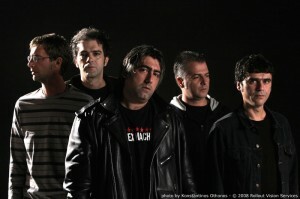 With sixth member Panayiotis Berlis in 1996 , releases the album “The loss become our habit”. In 1997, participating in the concert Rock Of Gods, which was at the stadium of Apollon Athens (Rizoupoli), along with bands like Sisters of mercy. In 1998 they released album “Something wrecks hearts”. The same year, give their first concert at Rodon club. In 1999 T.L. was the opening act for Tindersticks live show in athens. In 2000, following the retirement of Panagiotis Berlis the band leaving Wipe Out, set up their own record company, This Is My Voice Records and released a double single “It’s All Who Came Late“. In October 2000 the album “The Silence smell sour” and at the end of 2000 Transparent Lilies modifies the song “Death” to the “Tribute to Pavlos Sidiropoulos” compilation. In mid-2003 released again from the This Is my Voice Records the record “What is left from happiness”. In 2004 Transparent Lilies performs out concerts all over Greece. (Indicative may be said that in 2001 gave 170 concerts across the country). 2005 – They release book / cd – “The ride of the day in 80 worlds” with the publishing company Indiktos. In November 2008 the album “And the love will still calls” is being released by Rollout vision services. On June 1, 2009 the Lilies announced through the official site their dissolution. The statement is signed by all band members except Thanos Anestopoulos. In May 2012 the album “And love will call again” is released on deluxe double vinyl edition by Labyrinth of thoughts records.